Basil Vitality Essential Oil Dietary Oil Sauce Up! Zest Up, Sauce Up, Basil Up! Basil Vitality Essential Oil has an herbaceous scent and taste which vitalizes all your culinary recipes! Perfect Asian and European zest in a 5 ml bottle. Play with this oil in sweet fruity smoothies or drinks. Complements strawbery, kiwi or even watermelon. Give watermelon or strawberry margarita or daiquiri a new twist! Use with lemon vitality, lime vitality or jade lemon vitality! This section is a fun and easy reference guide for Basil vitality essential oil. It will tell you how to use it and what to use it for. It will also provide you with some fun suggestions, safety precautions for you and your pet! As I receive new tips and testimonials for Basil essential oil they will be added to the page, so check back frequently! Want to Purchase Therapeutic Grade Basil Vitality Essential Oil? Go to the Oil Shop! 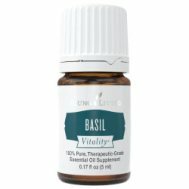 Buy Basil Vitality Oil here! Why is this Information Important? There are seven different chemotypes of basil and over 40 varieties of basil. So this is definitely a plant you need to know a little information when selecting basil essential oils! This is extremely important information. Remember, even though they may share some similar constituents they are not at all the same. Basil Chemotypes: Go to Basil Essential Oil Page for Info. What is the Origin of the Plant Name? The Greeks referred to basil as "King of Plants"! From this reasoning, basil comes from a Greek word "basileum" meaning "king". What Does this Number Mean? ORAC stands for Oxygen Radical Absorbance Capacity. It tells you the antioxidant capacity of a food item. Antioxidants have shown to reduce the risk of age related conditions! This was developed by the USDA researchers. For instance: Oranges = 750; Clove = 1,078,700. Wow! The number for clove is NOT a typo! Did you know that Basil is contained in Hildegard’s Physica Book? Hildegard of Bingen (1098-1179) was known as the first herbalist and naturopath of the middle ages. Her book documented her work. What are the Plant Properties? Tonic, and restorative. What are the Documented Basil Benefits and Uses? Cooking, flavoring agent for teas, drinks and recipes. Want to Learn about Basil's Emotional, Spiritual and Other Uses? Then go to Benefits of Basil Essential Oil Page! Place in drinks, cocktails or smoothie. Place in favorite sauce, soup, marinade or dressing recipe. Can this Oil be used for Animals? Always start slow. With a small dog or cat use a toothpick amount to start. (Dip toothpick in bottle to get that amount). Dilute extremely well!. I choose to use it in a specialty blend, rather than use it alone. The blends I use with basil are generally for stress and focus. One of my favorite professionally blended oils for focus is Clarity Essential Oil. Great for horses and the riders! What are the Safety Precautions? First, only use therapeutic grade essential oils! Basil essential oil has no known contraindications. It is Generally Regarded as Safe (GRAS) and allowed as a Food Additive (FA) for internal consumption by the FDA. However, those with epilepsy should avoid using this oil. Additionally, children under 18 months and pregnant women or women who are breast feeding should NOT use this oil. Children under 6 years old should not use basil as a dietary supplement. Did you know that Italian men would present women with basil sprigs to tell them of their romantic interest? And Italian women would place basil stems on their clothes to attract possible suitors!